Herr Drosselmeyer is a magician-like figure, with cape and eye patch. A character of great mystery and intrigue. In the Nutcracker Suite story, Herr Drosselmeyer is known as Clara's grandfather (depending on which version of the story you are familiar with, he is sometimes known as Clara's uncle or godfather). He arrives at the family holiday party with gifts for all, and for Clara he brings a wooden nutcracker in the shape of a little man. 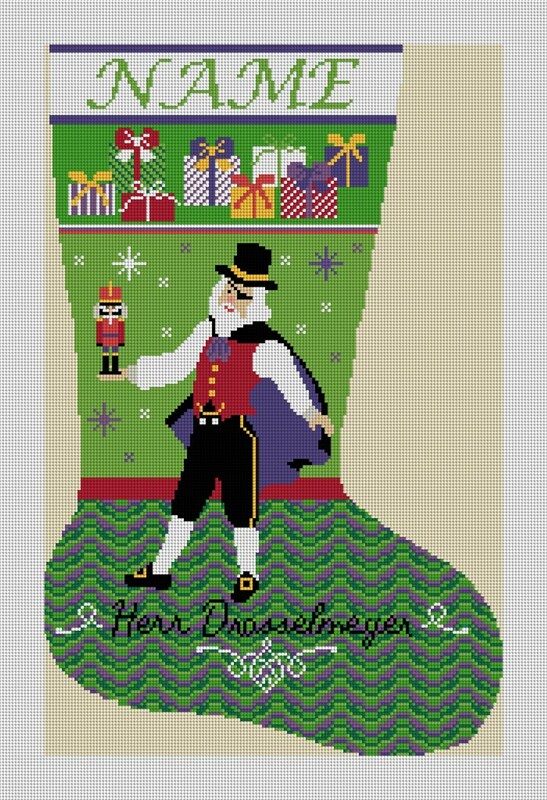 Our Herr Drosselmeyer needlepoint stocking, is a wonderful stocking to stitch for your fireplace; with or without the other character stockings from our Nutcracker Suite Christmas stocking set.